1. Should I seed now or wait for the moisture situation to improve? Seed now. Take advantage of suitable seeding days and get the crop in the ground. We have to assume (or is “hope” the better word) rains will come and if they don’t stop for a couple of weeks, seeding may face costly delays. 2. 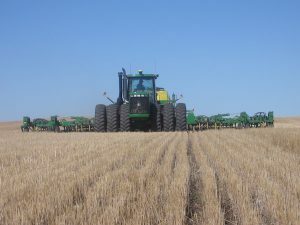 What seed-placed fertilizer rate is appropriate in dry conditions? Dry conditions increase the risks from fertilizer damage to seed and seedlings. Take extra care in dry conditions to limit seed-placed fertilizer to no more than 20 lb./ac. of phosphate. Again, leave a couple checks in fields where you turn off your seed-placed fertilizer for 50 to 100 feet. When you evaluate this strip later in the year, you’ll have actual evidence to evaluate in similar dry conditions in the future. 3. Should I seed deep enough to reach moisture? 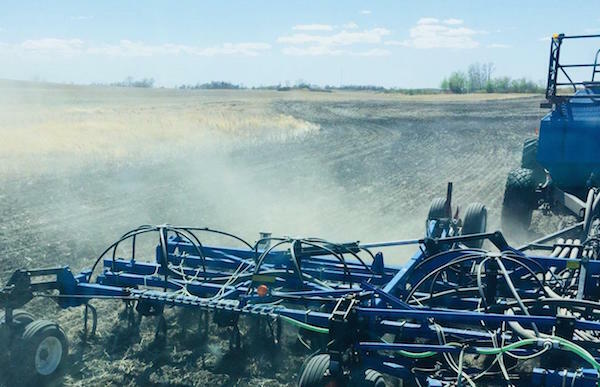 As a general recommendation, aim for 1/2” to 1” seed depth — even if dry — in early May and then consider going deeper to chase moisture in late May. By late May, soil temperature is consistently warm and seeding deeper to reach moisture should still provide fairly fast emergence. But know your drill. If you aim for 1.5”, are all openers in and around that depth? You want consistency. Read more. Wind effect. Wind increases water evaporation, so disturbed soil will dry out faster in windy conditions. This shouldn’t change the response to question 1, but keep in mind that the act of seeding on windy days could make the topsoil moisture situation worse. Packing pressure. If the drill allows for easy adjustment of packing pressure, increase pressure in dry conditions to conserve moisture in the seed row. In wet conditions, reduce packing pressure to limit hard crusting. Packing pressure can be a delicate balance, and often changes by soil type as well as moisture conditions. Soil type. Lighter textured soils are more prone to drying out. Seed these fields earlier if possible to take advantage of early-season moisture. Heavier packing pressure is acceptable in lighter soils. Do not “chase moisture”, but these are the fields that may benefit from slightly deeper seeding. Depth may change. Seeding depth can change after the fact if additional wind or strong rain moves topsoil into a deeper-than-usual seeding furrow.